Welcome to new site where I post interesting articles, tutorials, rants, everything I feel important enough to share with you. 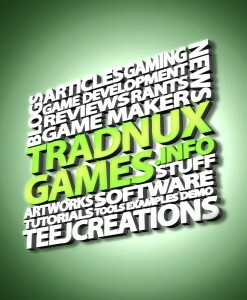 This site will also display some of my works in art, game development, applications and tools, graphics, etc. Part of this site is dedicated to the Game Maker (game development tool by Mark Overmars) aimed to create high quality games using the GM6 software IDE, and to increase it’s reputation to gaming industry. I created this forum so i can communicate with people who share the same passion and hobby which is to create computer video games and application tools. I created this forum so any person who are interested in games, especially theGMaks made games can come and discuss things and issues about us and our products. and make use of some software solutions and applications we can create. I also created this site so i can invite and have the people who are willing to work with me and be one of my staff and together produce nice and exciting quality games. Although Game Maker seems to be a very good tool, we will not limit ourselves into using it, we will also try to use other Game Development Tools as well. Moreover, TeejCreations do not just offer computer games, hence it also offers software tools and applications made in various programming languages. I primarily use the superb game development tool called the Game Maker by Mark Overmars from version 5 up to the latest version as our primary game making tool. It has a powerful programming language enough for me to create both basic and advanced 2d games or even 3d games and applications. So please feel free to do anything here, I would really appreciate any interactions and/or comments.